Dental crowns, also known as "caps," preserve the functionality of damaged teeth. A dental crown may be used to protect a cracked tooth, restore functionality of a tooth with excessive decay or replace a pre-existing crown. 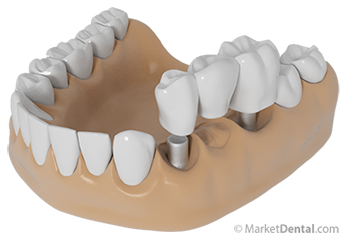 The purpose of a dental crown is to encase a needy tooth with a custom-designed material. Dentists today have a variety of conservative treatment options through which to restore teeth. If possible, these options should be explored and discussed before selecting the full coverage crown. Gingivitis is a chronic inflammation of the gum tissue (gingiva). Typically associated with poor oral hygiene, gingivitis is the early stage of gum disease (also called periodontal disease and periodontitis). Many people are not even be aware that they have gingivitis, because it is usually not painful. Gum disease (also known as periodontal disease and periodontitis) is an inflammatory condition affecting the tissues surrounding a tooth, and is the leading cause of tooth loss. There are a number of causes of gum disease, each of which can be corrected and controlled. There are a number of treatments available for gum disease sufferers, each of which varies depending on the severity of the condition. In order to determine the treatment modality that best meets your needs, your dentist will evaluate the extent of the damage caused by gum disease to develop a conservative initial plan. Gummy smile can have a negative affect on the esthetics of your smile. The optimal smile line appearance should reveal the least amount of gum tissue possible. Gum tissue visible in the smile line should have balanced, even contours that are in harmony with the upper lip. It is for this reason that many people with a gummy smile or excessive gingival display feel their smile to be unattractive, oftentimes feeling reluctant to smile at all. Necrotizing ulcerative gingivitis, better known as trench mouth, is an acute gingival infection caused by bacterial plaque. Although trench mouth is uncommon, certain people – such as malnourished children and young adults, smokers and people with immunodeficiencies – are more susceptible to this gum disease.